I wrote this book because I want you to enjoy the dazzling flavors of salmon. In it I focus on everyday ingredients and recipes that would not take too much time or effort. Salmon dishes that you can make anytime, anywhere, quickly and easily. Do you love salmon, but never dreamed you could prepare it over fifty-two fabulous ways? Then, I invite you into my galley! 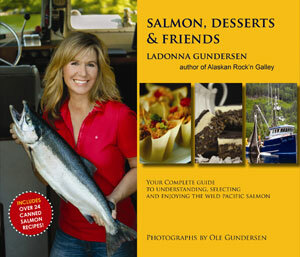 In the book I share many of the delicious galley-tested salmon and dessert recipes I’ve learned to make during my years as a commercial fisherwoman including: Smoked Salmon and Eggs in a Puffed Pastry, Delicious Salmon Chowder and Seared Salmon with Wild Blueberry Salsa. There’s even dessert! These outstanding recipes are quick and easy, with small space cooking in mind, making clean-up a breeze. You’ll also discover tips on selecting and preparing salmon, as well as information about catching methods and sustainability. I also hope the book will be more than just a collection of great recipes. I’ve included fishing stories and gorgeous photos that Ole took, and hope it will give readers a glimpse into the world of salmon fishing and life in Alaska. One of my Favorite “Go-To” Cookbooks!